This deck’s modus operandi is whittling the opponent’s hand down until they have no options left, and then pushing through with overwhelming power. 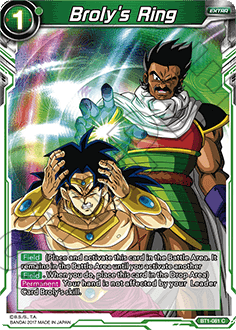 Its Leader, [BT1-057 Broly], along with cards like [BT1-074 Rampaging Lifeform Bio-Broly], all shrink the opponent’s hand. 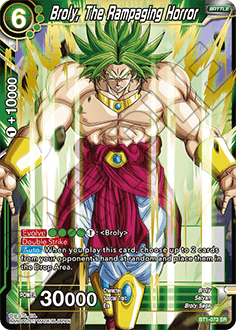 Once your opponent’s out of cards, that’s your chance to use [BT1-073 Broly, The Rampaging Horror] and [BT1-075 Rampaging Super Saiyan Broly] to deal the finish blow. 1.Attack aggressively to drain the opponent’s hand and life, particularly with [BT1-057 Broly] and [Energy Power Gotenks]. Once their hand thins out, they’ll have a hard time using combos to defend against your onslaught, making it easy for you to land clean hits on their life total. 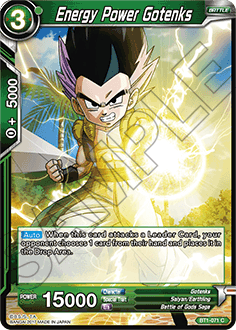 Since [BT1-057 Broly] can only attack Leaders, and [BT1-071 Energy Power Gotenks]’s skill only activates when you attack Leaders, feel free to ignore Battle Cards and go all-in. 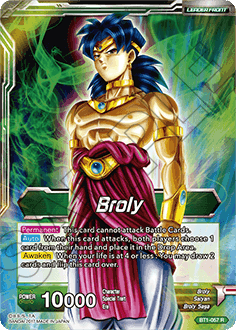 Broly, the deck’s Leader, has an ability that forces you to discard a card from your hand every time you attack. 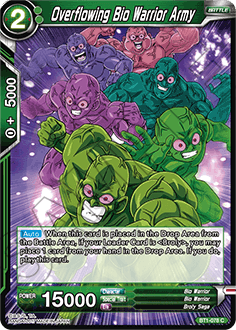 If you have Broly’s Ring, however, this effect is nullified, making it a must-have for the deck. 2.Evolve your Broly Battle Cards. 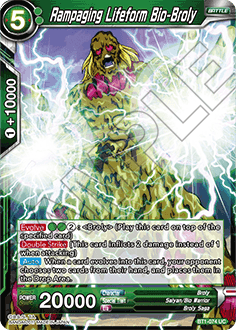 By evolving [BT1-076 Broly, Dawn of the Rampage] into [BT1-074 Rampaging Lifeform Bio-Broly] and [BT1-073 Broly, the Rampaging Horror], you can steadily drain cards from the opponent’s hand and push them into a corner. Whichever Broly you choose to evolve has skills that will empty the opponent’s hand in a flash. You can also use [Double Strike] to deal huge damage to their life total. 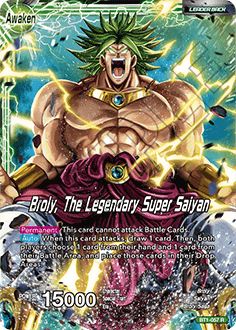 After [BT1-057 Broly] Awakens, you’ll need to send Battle Cards to the Drop Area every time he attacks. If you send [BT1-078 Overflowing Bio Warrior Army] to the Drop Area, its skill allows you to put it back in play in Active Mode, ready to attack again. Take advantage of these chances to attack repeatedly while thinning your opponent’s hand to win!